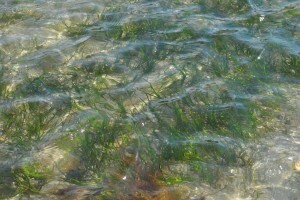 Eelgrass is an ecologically and economically valuable marine flowering plant which provides habitat to a variety of marine organisms, serves as a food source for others, and helps to stabilize sediments and improve water quality. Based on mapping carried out by the Department of Marine Resources, there were 3,174 acres of eelgrass in Frenchman Bay in 1996. In 2008, mapping revealed 1,076 acres; only 34% of what was there in 1996. In 2010, 35 acres of eelgrass were lost from the Jordan River. By the spring of 2013 it was evident that there was an additional significant loss of eelgrass in the bay. Eelgrass in restoration areas at Hadley Point, Berry Cove and around Thomas Island disappeared. Taunton Bay eelgrass disappeared as well. As of August 2013, there was an estimated 75-183 acres of eelgrass left in Frenchman Bay. By 2030, restore eelgrass to 1996 levels at Hadley Point, Thomas Island, part of Berry Cove, and part of the Jordan River. Mount Desert Island Biological Laboratory (MDIBL) has been carrying out eelgrass restoration efforts in Frenchman Bay since 2007. These efforts will continue in the priority areas with continued support from volunteers, interns, AmeriCorps members, and the expanding network of Frenchman Bay Partners. Successful eelgrass restoration depends, in part, on the effective communication of restoration objectives and activities to different bay users. In January, 2013, FBP representatives from MDIBL met with local mussel harvesters to collaborate on the designation of eelgrass restoration areas and transplant “donor” sites. Live mapping carried out by the FBP representative from Maine Coast Heritage Trust allowed for changes to be made to the proposed restoration areas according to the consensus reached in the room. These conversations were also facilitated by the FBP representative from the Margaret Chase Smith Policy Center, University of Maine, Orono. By the end of this meeting, an informal agreement was made, recognizing the agreed upon restoration areas and donor sites as no-harvest zones, which will reduce the risk of damage caused by harvesting equipment to the eelgrass and its rhizomal, or root, structures.